Hi There! Glad you stopped by. I found this little gem on Pinterest and decided I've pinned enough things it's time to do some! I traced a dinner plate to get a circle shape for behind the wreath. Then I chose a colour palette and started cutting out all kinds of sizes using the Hearts Collection Framelits for the Big Shot along with the Fashionable Hearts Embosslit. 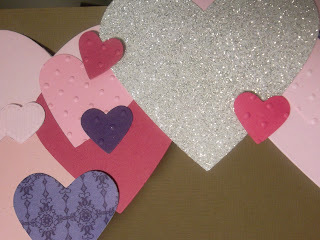 I added some texture using various Embossing Folders, stuck everything down and there's a fairly quick decor item for Valentine's Day. I just love the Silver Glitter Paper. So pretty! 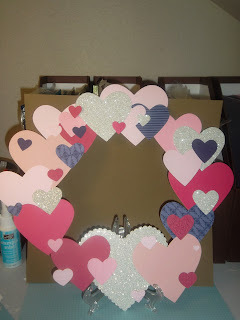 Tools: Big Shot Die Cutting Machine, Hearts Collection Framelits (Occasions Mini), Fashionable Hearts Embosslit (Occasions Mini) Polka Dot, Stripes, and Vintage Wallpaper Embossing Folders, Multipurpose Liquid Glue.